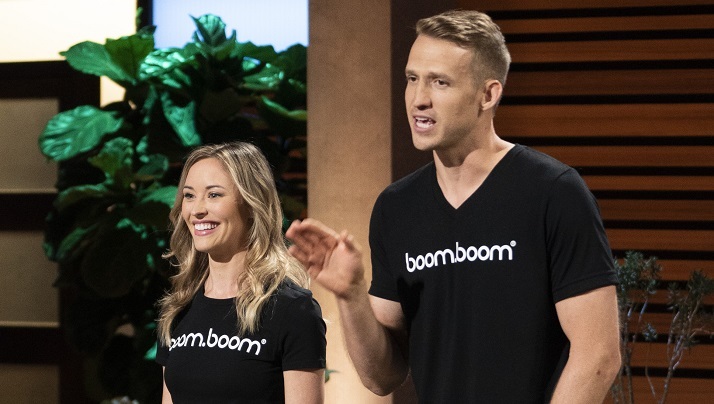 We’re thrilled to announce BoomBoom was recently featured on ABC’s Shark Tank! Presenting our line of nasal inhalers, we demonstrated what sets BoomBoom apart from other essential oil and aromatherapy products. Your sense of smell is powerful and can have a significant impact on your overall well-being. Until today, your nose has been ignored and that’s where we come in. Our team is committed to creating unique products that allow people to stimulate their senses in new ways and experience immediate healing benefits. Our products are made from all-natural, plant-based ingredients. Using the power of essential oils and aromatherapy, BoomBoom nasal inhalers enhance your psychological and physical well-being. Unlike the buzzing energy of caffeine, BoomBoom offers a different kind of mental energy. Inhaling provides an immediate, refreshing boost, which is helpful when you’re going through a stressful moment, need to calm down and bring your mind and body back into balance. Inhale and boom, you feel the effects (hence the name). All of our ingredients are clean, plant-based and derived from natural sources. Our products are perfect for on-the-go, so whenever you feel the need for an energy boost, stress relief or breathing support, we’ve got you covered. With proven positive results, BoomBoom helps with a wide variety of issues. Need to improve your mood? Try the Energy + Mood Essential Oil Roll-On. How about reduce stress? The Relax + Unwind Essential Oil Roll-On can help. And if you’re looking to increase your mental focus, the Breathe + Focus Essential Oil Roll-On works wonders. The essential oils in aromatherapy stimulate the smell receptors in your nose, which are connected to the brain. Inhaling essential oils helps treat many different mental and physical health issues. Looking to relieve pain? Boost focus? Improve sleep? There are many types of essential oils, each healing the body in unique ways. The best part about essential oils is that they are multi-purpose, so depending on what you need to heal, you can find a specific oil that will get the job done. The essential oils used in BoomBoom’s all-natural nasal inhalers help boost focus, improve mood and enhance breathing. Inhaling stimulates the sensory nerves inside your nose which are connected to the brain – enhancing your cognitive function and helping you concentrate when you lose focus. We created nasal inhalers to trigger your body’s cold receptors, providing a cool, refreshing sensation. Did you know scent is tied to memory? You can use BoomBoom as a mental anchoring tool and link each scent to a positive experience. By breathing in the healing vapors, this opens up your airways for better breathing. Are you ready to awaken your senses and BoomBoom?